“I thirst,” Jesus cried out. It isn’t anything surprising, if we know what crucifixion was about. First, He was flogged. 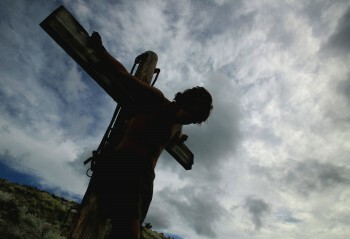 Then brought to the place of crucifixion, nailed to the cross and left to hang in sun. Thirst was meant to be inevitable part of torture involved in crucifixion. What do people think, how do people feel when they hear about Jesus sufferings, about His crucifixion, about His thirst on the cross? Often it could evoke compassion, mercy, pity. Just imagine how Jesus felt on the cross! Shame, rejection, pain, thirst. It is even difficult to think about it. For if we are more or less decent people, of course, we want to show compassion and mercy to someone who suffers so much. When people meditate upon Jesus passions, about His pain and thirst on the cross they can become very sympathetic, very compassionate and touched by what Jesus experienced. Don’t be! Yes, I’m serious, don’t be! This is not why these passion narratives are given to us. It is good to be compassionate and merciful, these are noble virtues, but we don’t read and meditate upon Jesus suffering to feel pity about what happened to this poor man. No. When we meditate upon Jesus passions, and today on these words “I thirst”, we need to understand that these accounts are left to us with the specific purpose. To meditate on specific things. Today I invite you to meditate upon two questions. First, why was Jesus crucified? Second, how did it happen? Why and how did it happen? If we know ‘why’ and ‘how’, we’ll also know how to meditate upon Jesus passions. So “why did Jesus have to suffer?” This is not a popular topic today. We like to talk about pleasant things. About good news that make us feel good and think good about ourselves. Sufferings isn’t one of favorite topics among contemporary Australians, not even among Christians. But the answer to this question is even less popular, – He was crucified because of us. Because of me. Because of you. Because of each of us. Because of who we are and what we have done, and what we keep doing. Because of our sin. Today we live in this incredible prosperity. The world hasn’t seen anything like that before. Australians are especially blessed. Vast majority of people even today can only dream about life that we have here. We have plenty of everything. But still – most Australians live in thirst. In thirst that can’t be satisfied. What is thirst? You thirst when you don’t have enough; enough water, as in Jesus case. But you can thirst for many other things. That what we do. We thirst to be clear about who are we? We pour out our hearts to prove that we are somebody by our achievements, merits or status and it is never enough. We thirst for happiness and joy, and we acquire new stuff, and have more entertainment. But there is more and more depression, everywhere. We thirst for meaning in our lives, we don’t know where to look for is, – having more hobbies, but there in greater void in our society than it has ever been. We thirst for love, but we have forgotten what this word means, so we look for something we don’t even know, we run from one relationships to others, trying to please ourselves, and it doesn’t work. We thirst for security and peace, we work longer hours, built larger houses, save more, but there is no peace, no shalom. Prophet Isaiah put in well. “Why do you spend your money for that which is not bread, and your labor for that which does not satisfy?” (Isa 55:2) Our thirst remains. For we try to satisfy it in wrong places. People often think that sin is something bad we do. Killing, stealing, explicit sexual promiscuity. If we don’t do something screamingly evil, we are fine. But, dear brothers and sisters, sin is when we look to satisfy our thirst for good things in wrong places. When we expect what only God can give, from someone else. To desire to have dignity and value, to desire to live in joy, to live meaningful lives, to live in peace – all of these are good things. We are created to have them. God the Father is more than willing to give them to us. This is our sin, when we rebel against God the Creator, when we want to be owners of His creation and masters of our lives, instead of living as beloved children of the Father and servants to our neighbors. This is the sin when we want to do everything our way – to decide who are we, how we are going to live, what will give us meaning, joy and peace. We are not going to listen to anyone! We want to be god’s ourselves. We want to create our own paradise, just … without God. This is why Jesus had to come and to suffer. For we are such rebels. We not only reject God, we also corrupt and abuse His good creation. Our attempts to create paradise for ourselves, so often create a hell instead, for ourselves and for others, and we just keep and keep provoking God’s wrath. It was not possible. This is what kind of ‘paradise’ we merit with our lives. The cross. If God was only just, these would be us, heading towards the cross, not Jesus. He suffered, He thirsted… instead of us, instead on me and instead of you. This is one thing we need to meditate upon again and again – what our sin cost to Jesus. But we can’t stop here. There is much more. For God is not only just, He is also incredibly gracious and merciful. Here we need to ask our second question, how did this happen that Jesus was crucified? How did this happened, that He, the fount of living water, found Himself on the cross, thirsty? Was this an accident? No. That was His choice. That was the choice of the Son of God. He knew that sin has to be destroyed before it destroys entire creation. He knew that the cup of God’s wrath can’t be taken away. He knew that it was either us, or Him. You or Him. You know what He chose. He chose you. And He did it in the most remarkable way. Do you know how Jesus was talking about His cross? As about His exaltation, as about His hour! On the cross He received ‘this paradise’ that we deserved, so that only we can receive eternal life with Him. When we look at Jesus cross, at His thirst, we need to remember, that was His choice, He did it deliberately for us. He took our place. All the way to the cross, to His ultimate exaltation, He was in control of events. He went to Jerusalem. He delivered Himself into hands of His enemies. He was still taking care of His mother while hanging on the cross. He chose to thirst, so that our thirst could be satisfied once and for all. So that we would wake up and realize seriousness of our sin, and would rejoice in God’s solution. When we begin to realize and appreciate what kind of God He is, how committed to us, how passionate should we be to please Him?! Not in fear of His wrath, for all of it has already been poured on Jesus, but cherishing His love. No one will, nor can love you as much as Jesus does. No one will ever hold you as precious as God the Father does. We learn how much God loves us, how much He loves you, when we find out that even His sufferings, thirst and death in our place – He calls His exaltation. This is how He shows the depth of His affection to you. This is another thing we should meditate upon. Again and again, and again. Love beyond comprehension. Given to you. There is just one more ‘but…’ You know about it. As long as we live in this world, thirst will remain. Jesus has freed us form the thirst of eternal punishment, God the Father blesses us with so many gifts, that we don’t have to thirst and can be content. However, the more we learn about God, about His radical, undeserved love towards us, sinners, the more our hearts will thirst for His presence in midst of this life’s trials. As psalmist wrote: “My soul thirsts for you like a parched land.” (Ps 143:6) Like a parched land for water. We can enjoy a foretaste of God’s presence already now, when true God comes to us in Divine Service, to forgive us, to comfort us, to listen our prayers, to feed us with His life giving body and blood, to bless us… We can also experience this foretaste in love of our brother and sisters in Christ. It is beautiful. But this is only a foretaste. Come, Lord Jesus, come and fulfill your promise! ← Ugly truth about macro-evolution.